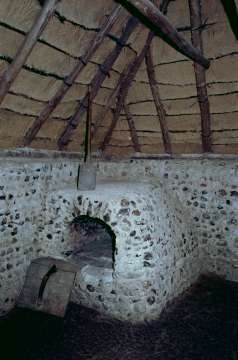 Flint cottage reconstruction based on archeological excavation at a medieval village site at Hangleton, near Hove, Sussex. 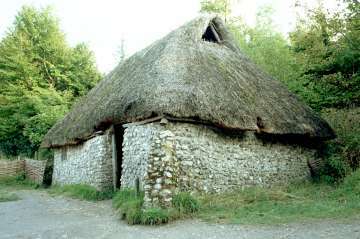 Straw thatch has been used for roof covering although turf, wooden shingles, other thatching materials such as furze or broom could have been used in the original. Only two cottages remained by 1428 after a long period of decline from about the middle of the 14th century. This Black Death was probably a major cause of this decline, with climate and economic factors also being involved. 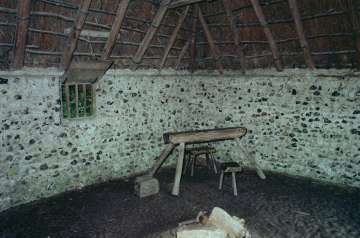 Second room interior with stools and hearth reconstruction in foreground. The type of timber used and the pitch of the roof is also open to conjecture, but the walls have been reconstructed using the original ruins of two cottages on the Hangleton excavation site. 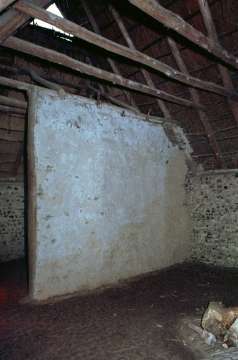 Walls about three feet high in places had survived and the quantity of flint debris was used as a basis for estimating the original wall height.